A lively introduction to apparel production with unparalleled focus on quality. 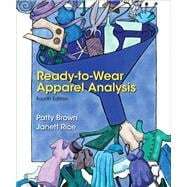 Ready-to-Wear Apparel Analysis, Fourth Edition, introduces fashion students to the production of ready-to-wear apparel and the objective evaluation of production costs and product quality. It provides a comprehensive overview of apparel production balanced with an impressive level of detail about apparel quality, enabling students to design and specify the best quality apparel possible at a particular price point. The book takes an industry approach, integrating the study of traditional clothing design and construction with current practices of the apparel manufacturing industry. Coverage of practical issues, industry methods, best practices, and related vocabulary effectively prepares students for tasks and challenges they will encounter in fashion careers.